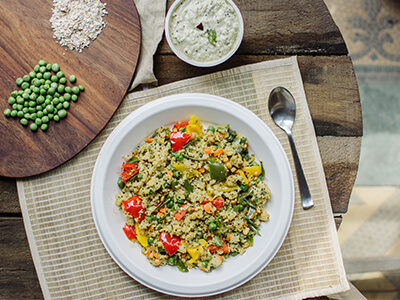 Ready-to-cook breakfast, 50% more protein than normal upma: contains oats, peaprotein & dehydrated vegetables. Protein Rich Upma is a combination of oats, wheat semolina, pea protein, rice flakes & dehydrated vegetables. It contains fibre which is required as part of everyday diet. It is a tasty and nutritious breakfast item. 1. Oats contains a soluble fibre called beta-glucan, which lowers cholesterol in 3 ways : binds with fat substances in the gut and prevents their absorption into the body; Preventing cholesterol like substances in bile from being reabsorbed. Since less cholesterol is absorbed by the gut, the body has to take more cholesterol out of the blood stream and process it into the bile to help with the digestive process. This serves to help reduce the levels of cholesterol in our body. 3. Pea protein which is concentrated source of good quality protein (80%) as it is allergy-free (unlike soy protein), has good balance of amino acids, contain lysine and arginine which are considered beneficial for active lifestyles. 4. Bengal gram dal and black gram dal are rich source of protein . 5. Dried vegetables are rich in insoluble fibre, which keeps the person full for longer time. it’s fiber contents helps for weight loss by eliminating fat particles and toxins out of the body and also by maintaining gut bacteria.